Fresh, delicious, easy going – that's tibits for you. choose from over 40 homemade vegetarian and vegan salads, hot dishes, soups, freshly pressed juices and desserts from all over the world. you pay by weight, so you can take as much or as little as you want. 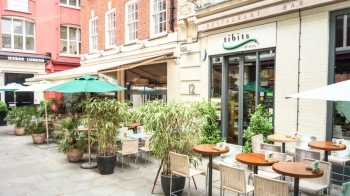 tibits is the perfect spot for breakfast or after work drinks, a leisurely meal or some quick take-away.